I added more details to this painting yesterday. It's really tough to decide when a painting is finished. See if you can find all the changes. You can check out this previous post from Sept. 18th to see what it looked like before. The first person to leave a comment on this post with all the changes will win an 8" x 10" print of this fun Halloween design. If no one finds all of them, the print will go to the person who finds the most changes by next Monday, Oct. 28th. Thera ara straw columns, ghost in the windows, the door pumpkins, shades on the windows, children dressed, bats in the trees, spiders and cobwebs,!! You make this hard Catherine, but, I found many. 12. People in the window of the bottom left house. 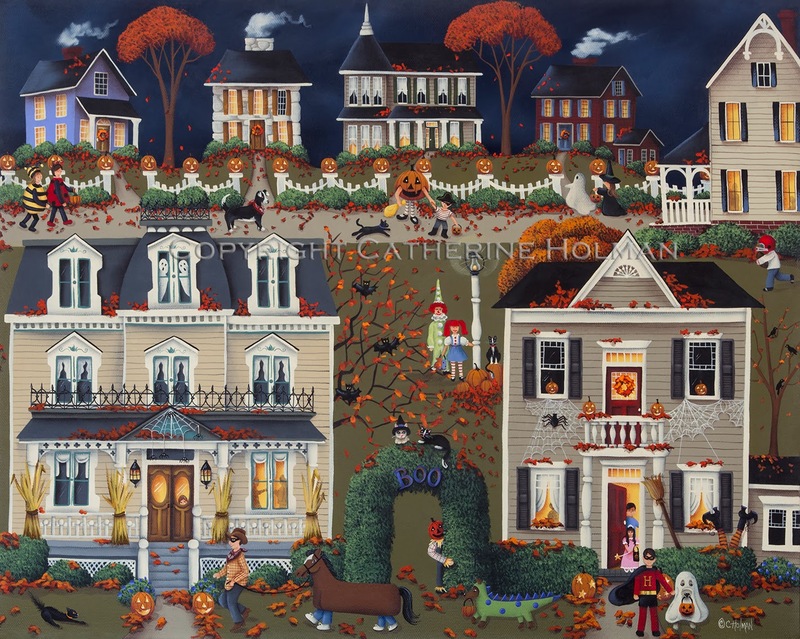 Sure hope I got them all and I love this painting, your houses and scenes just mesmerize me all of the time. Especially the fall and winter ones. Catherine, I commented and it didn't show, so if 2 show up that is why. You made this very hard, LOL, but here is what I saw. Don't know that I got them all but I sure found a few. Love the painting, love all your fall and winter paintings. Never stop painting!!! I've flipped back and forth a number of times and found it a lot of fun to check up on these folks. I'm wishing them all the best! The details do delight!